Fire Words is one of the first games I installed on my iPhone when the App Store launched last year. Countless games have come and gone on my iPhone in the ensuing 10 months, but Fire Words has remained a constant. Hot Time: Form words out of three or more adjacent letters in Fire Words, but leave a letter sitting for too long, and it will start to catch fire. The rules of the $2 game from omz:software are simple. You’re presented with a set of letter tiles, and you must form words of three or more adjacent letters—the longer the word, the higher the score. New letters replace used letters. The twist to Fire Words is the letters gradually increase in temperature after each turn and eventually catch fire. Once a letter burns out, the game is over. To keep a letter from getting too hot, you must use it in a word—this forces you to use all of the letters. 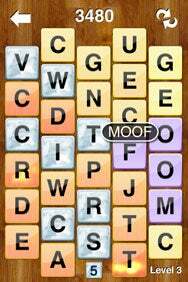 You can also freeze a tile by creating a word composed of at least four letters. However, in higher levels, frozen tiles will require longer words. If you get stuck, you can shuffle the tiles; however, you incur a score penalty, and all the tiles get hotter starting with Level 3 each time you shuffle. Your game is always saved so you can resume at any time. An addictive game usually features a simple formula with enough strategy and challenge to keep you coming back again and again. Fire Words delivers that. It is also perfectly suited for the touchscreen interface of the iPhone and iPod touch. Occasionally you might find yourself in a situation with all vowels or all consonants where it’s impossible to form words, but I can attest that after playing hundreds of games, this is rare. Also, if you think you’re stuck, try acronyms or abbreviations—they have saved me many times from flaming out. As for features, it would be nice to see how my high scores compare to other Fire Words addicts, but there is no global score capability. Fire Words is a wonderful word game that can keep you engaged for a minute or an hour at a time. Whenever I find a spare moment and don’t feel like settling into a more complex game, Fire Words is a perfect little diversion. Fire Words is compatible with any iPhone or iPod touch running the iPhone 2.x software update.